The ifo detail this month comes as the headline indices have more or less paused for a month at low reading levels. As we saw in the advance ifo report business expectations for 6-months ahead stand in their lower 24th percentile, a weak standing while the current situation continues to hold at its 89th percentile, near the top ten percentile of its historic queue of data. What is happening and what is expected to happen in the future could hardly be more at odds. We feature manufacturing data in the table since that tends to be the most directional set of readings. Manufacturing readings for the current situation, for expectations, for activity for demand and for orders all show negative readings on the month and for the most part these readings are like the headlines more or less in a holding pattern month-to-month. Here manufacturing expectations register a 14.8percentile standing- a standing that is lower less than 15% of the time historically back to 1992. Demand also has a below median standing with a queue standing in its 37th percentile. But the current situation for manufacturing still has a 78 percentile standing with activity at a 73 percentile standing supported with foreign orders at a 70th percentile standing. Foreign orders are stronger than orders overall that have just a 57 percentile standing. This underlines the German economy’s dependence of foreign growth. 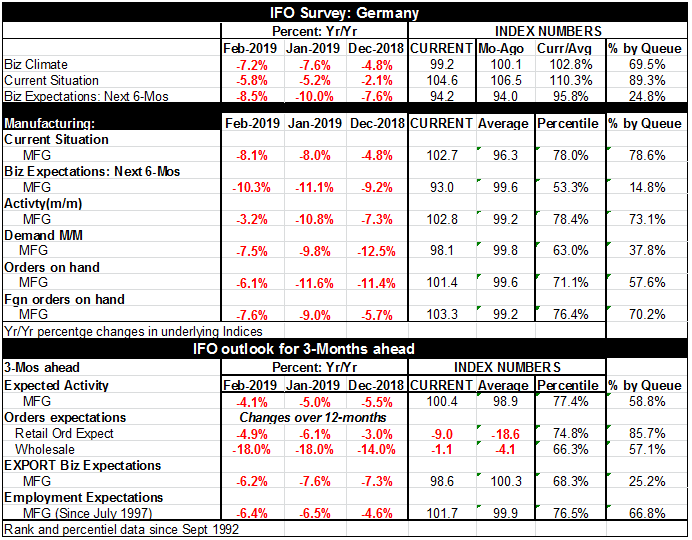 The ifo’s three-month-ahead outlook also has stopped deteriorating and on the month but still flashes negative readings when we look at year over year changes: expected activity, orders expectations, export business expectations, and employment expectations. The year-on-year deterioration in these gauges has come to a halt this month as February changes are generally better (smaller drops) than the changes reported in January. The queue percentile standings show the most strength in retail order expectations at an 85 percentile standing, followed by employment expectations at a 66 percentile standing and expected activity in manufacturing and for orders in wholesaling with both in their high 50th percentiles. However, manufacturing export business expectations are in the doldrums with a 25 percentile standing. The chart at the top shows that there has been a relatively steep falling off of export and employment expectations in the last few months. The monthly data seem to show that this drop-off may be slowing. And that would be good news. The US and China still have their trade spat in gear but the US has decided that enough progress is being made to delay the imposition of tariffs on the March 2nd deadline as has previously been planned. That could help to ease some concerns in the markets even though it is not the same as having a deal. On the Brexit front there is talk of extending the deadline for Brexit but it is unclear what that time extension would buy since the UK seems to be making no progress in getting Parliament behind any particular deal. An extension might just drag out the weakness in the UK longer by extending the period of uncertainty. The chart on expectations shows a fluctuating pattern with business and employment expectations both in a down-cycle. And those down-cycles are relatively severe. However, the readings on those expectations still fall in the ranges that have held since 2010 when the global economy has been in recovery. There is nothing in the current pattern of weakness that would provide a valid comparison to the earlier period of global recession.